I have been waiting almost a year to share this with y’all! I wanted to share this Cherry upside Down Cake with Almond Whipped Cream last year, but my pictures were awful. I was too embarrassed to share them with y’all. I didn’t have the opportunity to re-take the pictures …. so I waited. Patiently. Needless to say, photography has been a huge learning curve for me. I seriously underestimated its importance when I first started blogging. I didn’t try to style my food, I didn’t pay attention to lighting …. and it showed. Along the way, I learned a few things and started to actually try to take decent pictures. If you look back at my old pictures, you can see where I kinda started figuring out the importance of light – because all of my pictures are taken outside. No joke. At that point, it was literally whatever food I was photographing, plopped on a plate. *sigh* I had (and still have!) so much to learn! I don’t think learning ever ends, does it?! Preheat oven to 350°F. Grease a 10-Inch Round Pan and set aside. In a microwave-safe bowl, melt the butter. Stir in the brown sugar and microwave an additional 60 seconds. Mix well and pour over the bottom of the prepared cake pan. 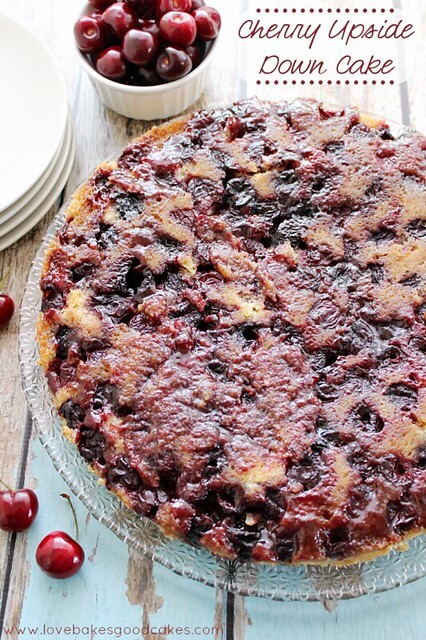 Top with the cherries, in a single layer. In a medium bowl, combine the flour, nutmeg, baking soda and salt. Set aside. 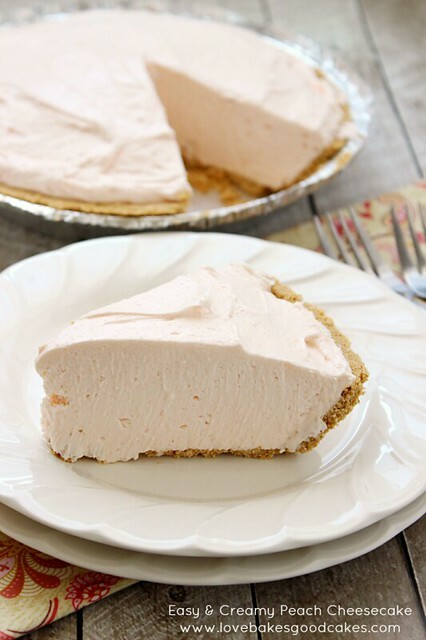 In a separate medium bowl, beat the butter with the almond extract with an electric mixer until creamy and smooth. Gradually beat in the sugar. Increase the speed to medium-high and continue to beat until light and fluffy – about 4-5 minutes. Add the eggs to the butter mixture, one at a time, beating well after each addition. With the mixer on low speed, add half of the flour mixture and mix just until combined. Add the sour cream and mix just until combined. Add the remaining flour mixture beating just until smooth. The batter will be thick. Gently spread the cake batter over the top of the cherries with a spatula. Bake for 45-50 minutes or until the cake is golden brown and the cake tests clean when a toothpick is inserted near the center. Allow the cake to cool in the pan for 15 minutes. Carefully run a knife around the perimeter of the pan. Cover the cake pan with a cake platter and invert so the cake is on the platter. If any cherries have stuck to the pan, replace them on top of the cake. To make the almond whipped cream, beat all of the whipped cream ingredients in a medium bowl with an electric mixer on medium-high speed until firm peaks form. Serve the warm cake with dollops of the whipped cream. Refrigerate any leftovers. If you don’t have a 10-in round cake pan, this is the pan I use! 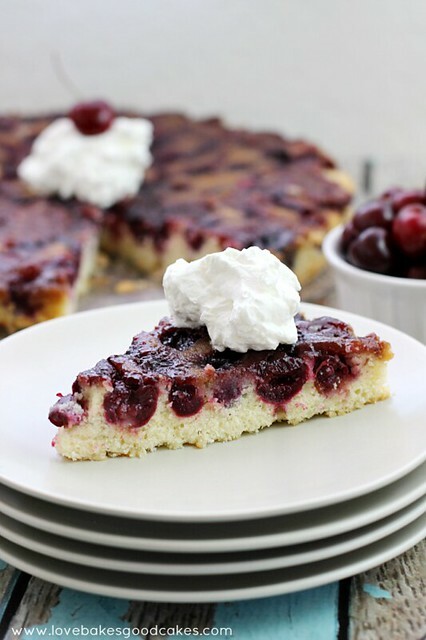 This Cherry Upside Down Cake with Almond Whipped Cream is the perfect way to end a Summer dinner. Why not make one soon? « Peach and Blackberry Teagarita – Have a refreshing Summer with Jose Cuervo Teagarita! This cake looks really amazing! And I love the photos! Two of my favorite flavors, Jamie…and the photos are gorgeous! Your photos have changed so dramatically and are just gorgeous, Jamie! You really captured the beauty and deliciousness of this cake….it looks amazing!! Your cake looks delicious, and your photos are fantastic! I know how you feel though, I have serious photography insecurity. It's getting better, but I'm still learning. I think it's the hardest part of food-blogging. Love yours! Love cherries. Look looks delicious! Pinned. Love this cake Jamie! I'm with you on the photography thing. I had no idea what I was doing back in the day – I'm still learning. This is a great picture and thanks for sharing!! This looks amazing! And the photos are beautiful! I really want to go buy some more cherries just to make this cake! It reminds me of one I did last fall with cranberries. Mmm, I love cherries! This cake looks fantastic and the pictures make me want to eat it right now! Lovely, beautiful photos Jamie. You did Good!!!!. 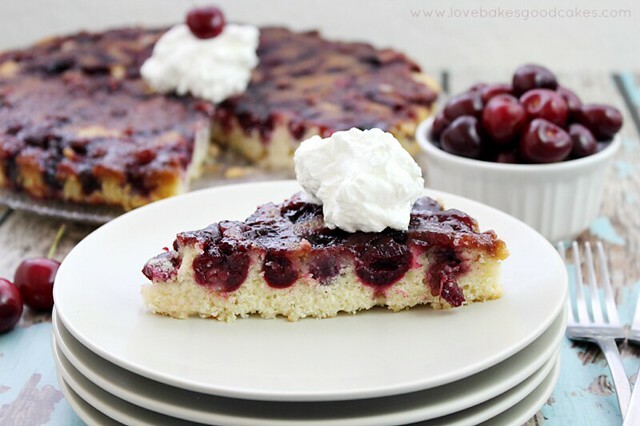 I love this cherry cake, which I must give a try. Thanks so much for sharing with Foodie Friends Friday Party. Pinned/shared. 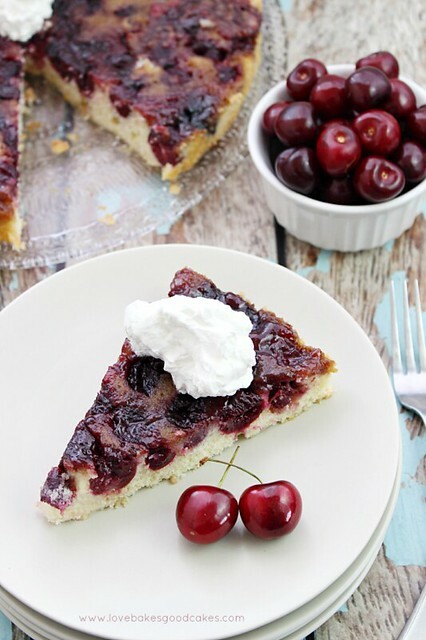 I must live under a rock, I never heard of cherry upside down cake but I love the idea. Cherries are at peak season here in NY cant wait to try this. Pinned. 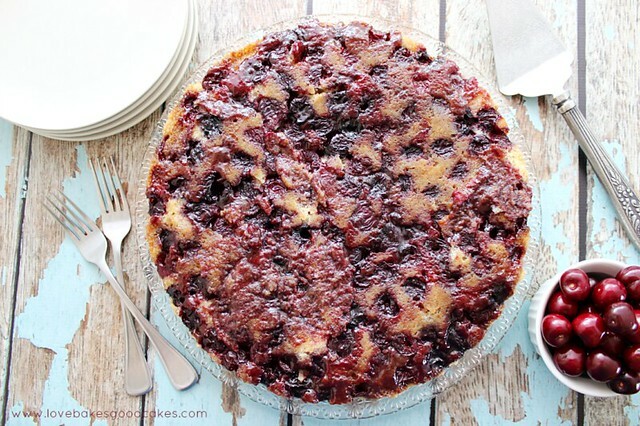 Your Cherry Upside Down Cake with Almond looks fabulous, we will love this cake! Hope you are have a great week and thank you so much for sharing with Full Plate Thursday. Beautiful pictures, Jamie! I have always loved your recipes, but the new styling of shots makes the food look so much more enticing. Thanks for being such a loyal "linker" to my parties! 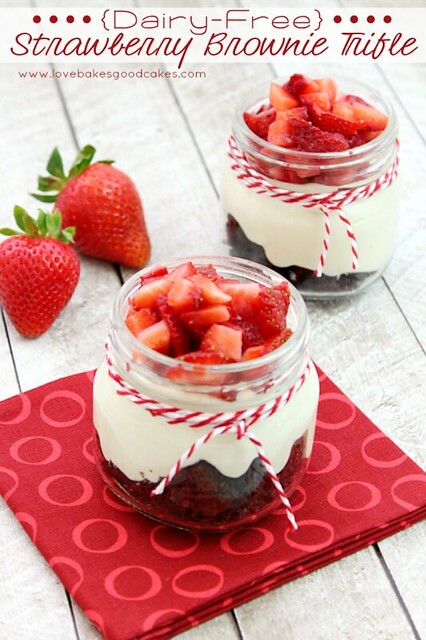 Your recipe is being featured on Foodie Friday today. I will be pinning and tweeting it this week too. This is my first time visiting your blog! Your beautiful upside down cake drew me here! So nice to meet you, I will be following!